The first question you might ask yourself is what is this place? And why does it require so much effort? Sintra is a UNESCO World Heritage site, as it features several stunning palaces and castles, some of which date back to the 8th century, that stand watch from high up over the town. The town itself is nestled into the Sintra Mountains, and this combination of historical significance and picturesque location mean that it's often described as one of the most beautiful places in the world. We only had time to visit Pena Palace, but we were able to admire the Castelo dos Mouros from a distance. I can definitely appreciate why Portuguese royalty have built some of their most impressive architectural buildings here. But therein lies the tricky part... how do you get up to these amazing spots? Before you start scouting your plan for admiring these palaces up close, you'll first need to get to Sintra. To do so, take one of the trains that depart Lisbon every 15 minutes (weekdays) and 30 minutes (weekends). We caught the train out of the Rossio train station, which is next door to the Restauradores metro station. You can buy your train tickets from one of the "bilheteira" kiosks in the Rossio station. 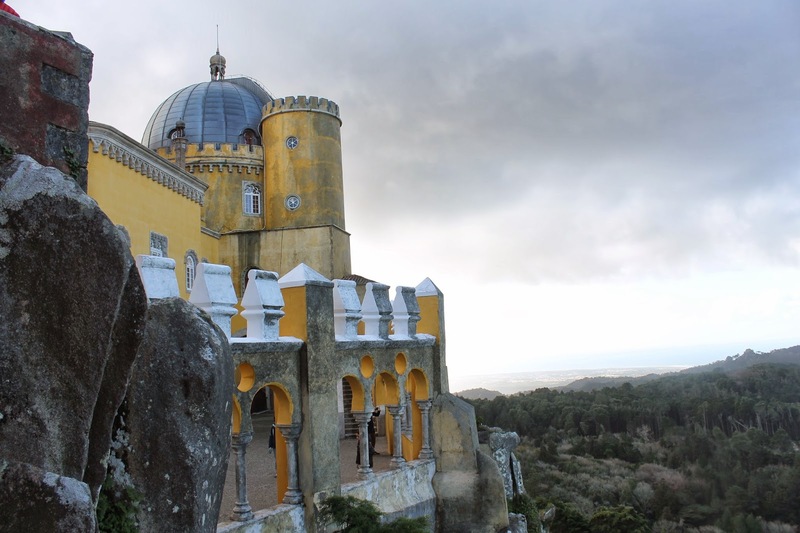 If you're just planning a day trip to Sintra and back, you'll want a 4-zone ticket, 2-way. This will cost approximately 4 Euros. You'll need to make a separate purchase for each adult ticket (we weren't able to figure out how to change the quantity on the automated machine). Then you'll board the train. They're quite nice and it's an easy 40 minute ride. Just long enough to create a few masterpieces. When you arrive at the train station, there will be a flurry of people desperate to figure out what bus to take. Grab a map of Sintra at the ticket window, walk right by the confused tourists, and keep walking to the town centre (signs will help guide your way). It's a fairly easy walk, and do-able with a stroller. 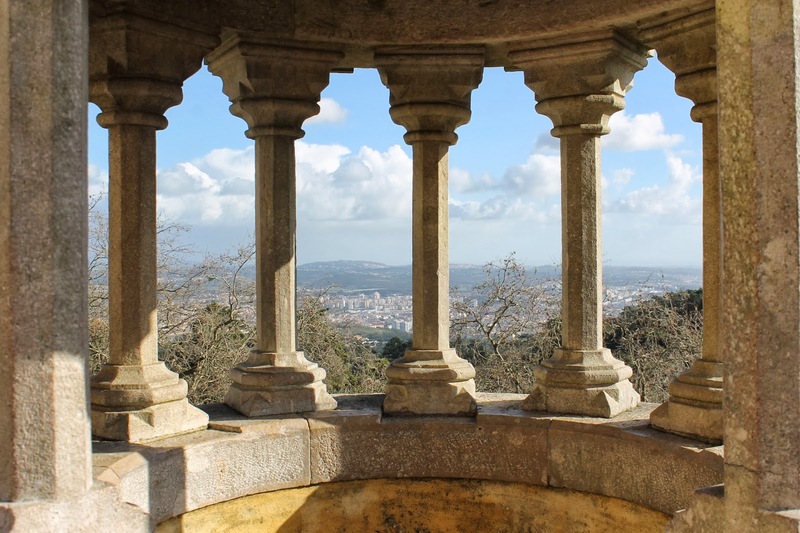 It will give you a chance to take in some of the beauty of Sintra on your own feet (as opposed to a bus or a trolley, which you'll take a few minutes later.) If your kids are ready for some playtime, you'll pass by a park and a playground on your way. Since we took the 8:38 a.m. train out of Lisbon, we arrived in Sintra's town centre around 9:30, just before the attractions opened at 10 a.m. We took this opportunity to duck into one of the many cafes and ordered some hot chocolates and a few queijadas, a pastry unique to Sintra. It was a good idea to get everyone's bellies full and bladders empty before the adventures ahead. The tourist office will be easy to find, and from there you'll want to catch Bus #434 on the street corner in front of the office. You'll buy your 5 Euro per person ticket on the bus. Bus #434 is hop-on, hop-off style, so keep your ticket as you'll use it on your return back into Sintra. This bus will take you to the Castelo dos Mouros, Pena Palace, and a couple of different stops in the town centre. It runs on a loop and comes around every 15-20 minutes. 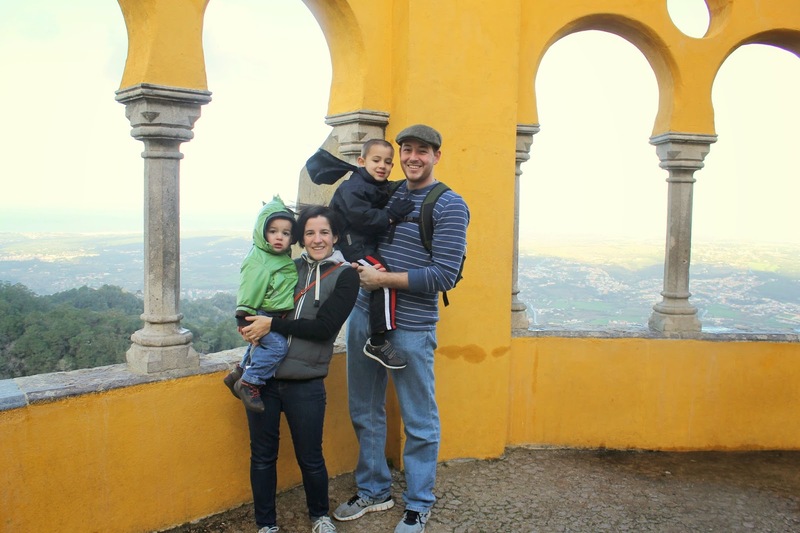 We knew our family could probably only handle visiting one of the properties, and we chose Pena Palace. But if you have more time and a higher sightseeing tolerance, the Castelo dos Mouros also looked amazing. The bus ride from town centre to Pena Palace will last about 10-15 minutes up a narrow, winding road. If you get motion sickness, you may struggle on this bus ride. Big Arrow and I both battle this, so we tried to keep our eyes closed for most of the journey. My husband said it was a crazy ride to the top, but with breathtaking views down the hillsides. I breathed a sigh of relief when we stepped off the bus at the entrance gate to Pena Palace. We made it, I thought. That was relatively easy. Famous last words, as we still weren't quite there. At this gate, you'll purchase your entrance into the Palace. Regrettably, we chose the Palace and Park combo admission. We should have only done the park pass, as we didn't go inside the Palace walls itself. The Park pass will still allow you to walk the entire pathway around the Palace, and unless you have some burning desire to get inside its various rooms, in my opinion the combo pass wasn't worth it. Once you're inside the gate, you can let the kids run around the Queen's Garden while you wait for the trolley. (There's also a coffee shop and toilets here, if you didn't take care of that in town.) The trolley ride is 2 Euros per adult, and again, keep your ticket, as you can use it on the return. The trolley is an easy 5 minute ride to the Palace itself. When you step off the trolley at Pena Palace, all your hard work and navigation skills in getting there will be instantly rewarded. You'll immediately realize why Sintra is such a popular place to visit. I've never been to a castle quite like this one. 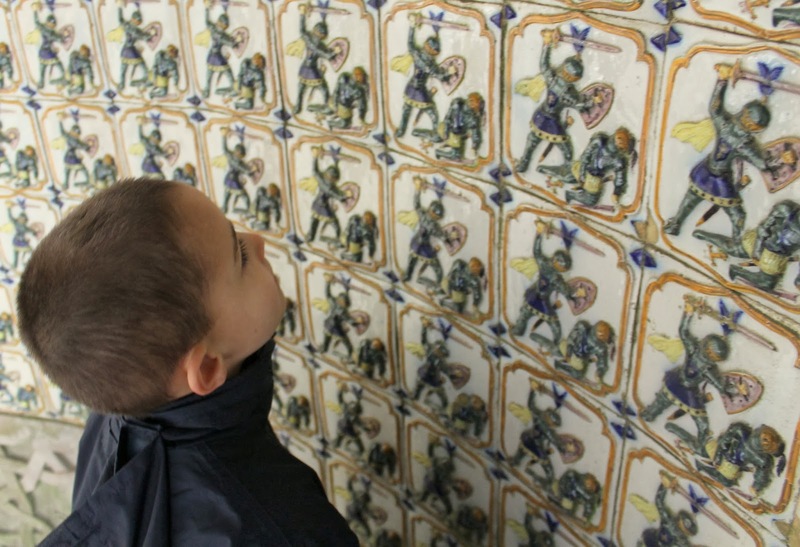 Vibrant colors (think yellows, pinks, purples and reds), exquisite detailed tiles, rounded towers fit for a princess, and jagged lookout towers perfect for aspiring knights in shining armor. The best way to enjoy Pena Palace is to walk the narrow pathway that leads around the building's exterior. It was an embarrassment of riches in terms of where to look: to my right was the Sintra hillside, dotted with other castles and estates and lush green forest. To my left was Pena itself, which somehow looked completely different at each angle from which I admired it. 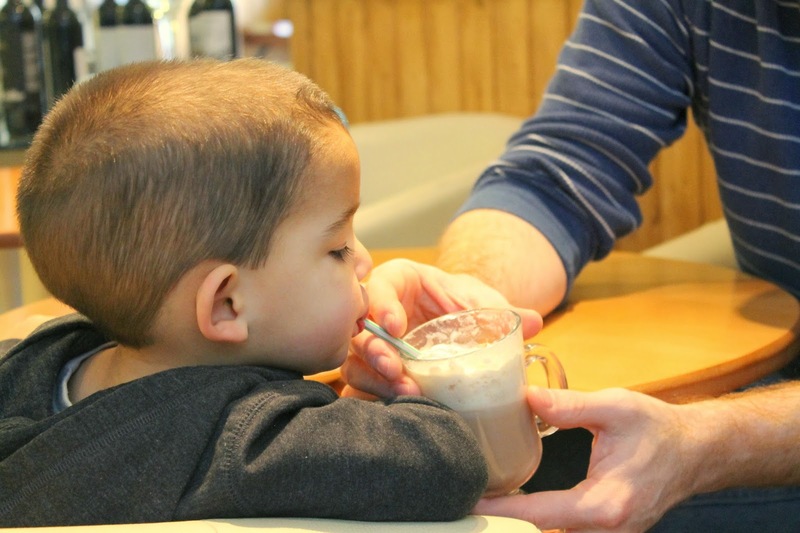 I've often noted on this blog that my kids are sometimes too young to really appreciate what we're seeing (not that this stops us!) I can honestly say that Pena Palace was the exception to this generality. They both stood still in complete silence at several moments, stunned by their surroundings. They were absolutely delighted to climb the turrets and look out from their posts. They played soldier, marching back and forth between gates, through tunnels, around corners. Frankly, they wanted to stay at the Palace longer than my husband and I did. You'll want to allow yourself at least an hour here, even more time if you plan to go inside or if you want to explore the surrounding parkland. To return to Lisbon, you'll do everything you did to get to the Palace, only in reverse. You should be all set with the tickets, as they were all round-trip rides. We grabbed lunch in Sintra's town centre (at a very forgettable restaurant), but it would have been lovely to pack a picnic and enjoy it on the grounds of the Palace. One of the hardest things for us to determine in advance of our trip was what to do about our stroller. Did we need it? Could we bring it? This is the one area I don't have a firm answer for you. We brought our stroller, mostly because we needed it to safely get to the Rossio train station in Lisbon from our hotel, and we were also happy to have it on our walk into Sintra's town centre from the train station. But beyond that, it certainly would have been easier without it. 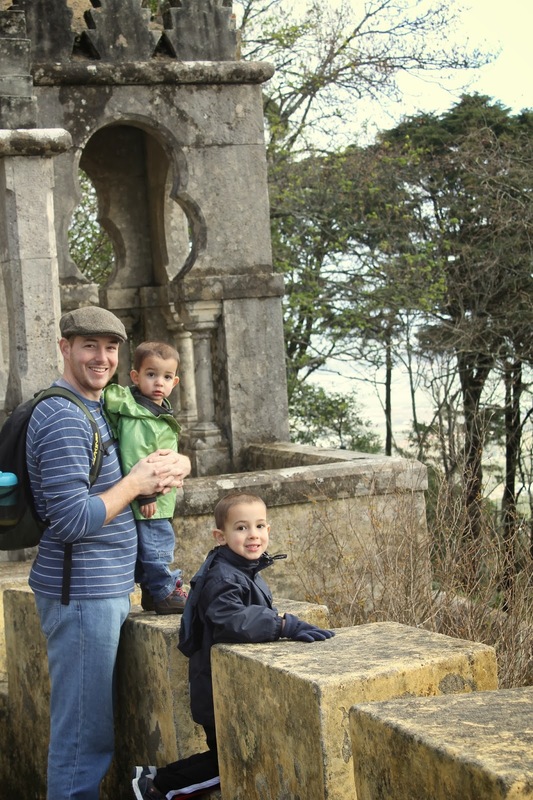 In fact, when we got to the entrance of the Pena Palace grounds, we found a hidden corner and tucked it away there. The pathway that surrounds the Palace building itself is not manageable with a stroller... too many steps and narrow points. In hindsight, I would have inquired at the Sintra visitor's center if there was a place we could properly store our stroller for the duration of our sightseeing time at Pena. If I had a baby, I would have simply done this day trip with a carrier and ditched the stroller all together. 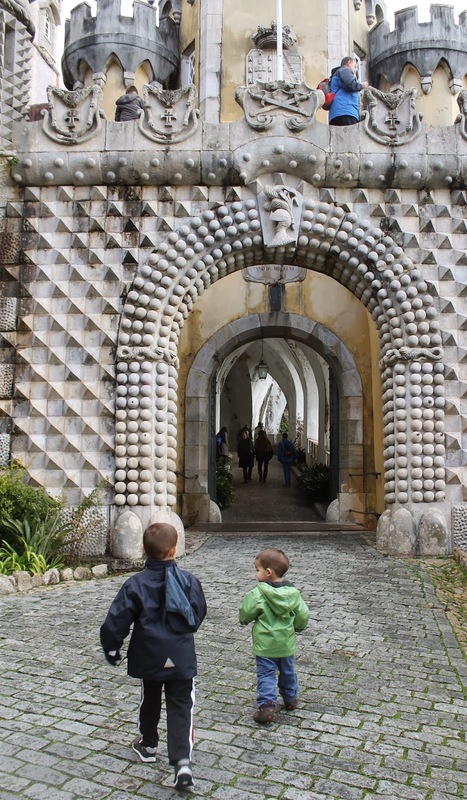 So yes, visiting Sintra with kids is very much possible. All it takes is a little planning, a few Euros in your pocket, and 3+ modes of public transit. 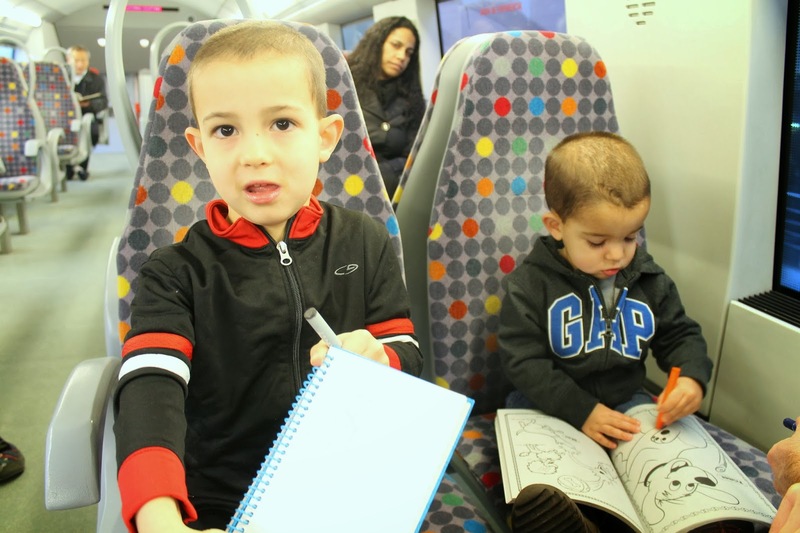 Pack your patience, a few activities for the kids to do on the train, some snacks, and get ready to be stunned by what surrounds you. You'll be well-rewarded for all that stroller pushing! You can read more about our travels around Lisbon and Portugal here.